Discrimination claims often arise in the employment context. Despite this fact, there are a number of anti-discrimination laws that protect people from discrimination outside of the workplace. The New York State Human Rights Law (“NYSHRL”) and New York City Human Rights Law “NYCHRL”) both have provisions making it unlawful for “a place of public accommodation” to engage in discrimination on the basis of race, color, age, national origin, alienage or citizenship, gender, sexual orientation, or disability. Discrimination in public accommodations is covered by most state and local laws. The term “public accommodation” is defined differently under both laws. Public halls, public rooms, public elevators, and any public areas or any building or structure. The NYCHRL defines the term as any “providers, whether licensed or unlicensed, of goods, services, facilities, accommodations, advantages or privileges of any kind, and places, whether licensed or unlicensed, where goods, services, facilities, accommodations, advantages or privileges of any kind are extended offered, sold, or otherwise made available.” The NYSHRL and the NYCHRL set forth a number of exceptions that describe what businesses are not considered places of public accommodation. The law states that “distinctly private clubs” that, among other things, “have a mechanism established to carefully screen applicants on any basis at all where membership is determined by subjective, not objective factors,” is not considered a place of public accommodation. 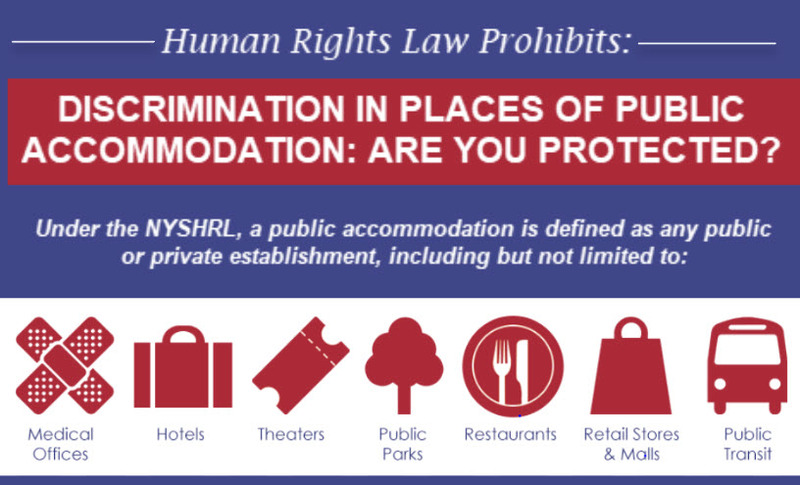 Notwithstanding the law’s objections, the anti-discrimination provisions of the NYSHRL and the NYCHRL mean business owners, retailers, and service providers are prohibited from refusing services or any otherwise discriminatory conduct to customers and members of the public. Talk to an experienced employment discrimination and sexual harassment attorney who can help assess your potential claim. If you believe you’ve experienced unlawful discrimination in a place of public accommodation, please give our experienced attorneys a call toll-free at 1-877-469-5297, for your free consultation.